Perhaps the people who are globalists, who accept that we have to hang together, are double-patriots. Globalism is about reengineering your society in the experience that has been accumulated elsewhere. The US has long served as a global model and a beacon of hope. Trump basically nixes all that. Trump’s self-righteous stance is not going to help successor governments in the US. If nations don’t cooperate, we will all go down the drain by ourselves. The former president of France, Charles de Gaulle, once said: Patriotism is when love of your own people comes first. Nationalism is when hate for people other than your own comes first. Do you think that’s a good description? Yes, I think the long-dead French president – himself the representative of a very proud and very sovereignty-orientated nation – had that entirely right. In contrast, with Donald Trump incessantly talking about being a nationalist, that brings out the worst in the American people. It’s also a road to nowhere. Trump neglects that in order to solve many of the problems we have at the local, national and global level, global cooperation is necessary. If it was too hot this summer, or will be too cold this winter, that’s all a consequence of climate change. Nationalists aren’t equipped to deal with these events and solve them. So Trump basically engages in an escapist act. So what’s necessary is to embrace patriotism and globalism at the same time. Correct. Take our readers, whether they live in the US, in Europe, in Australia or wherever. My sense is that very few, if any of them are global elitists who have no home base and no regard for the country they live in. I think they just have a dual sense of loyalty — to their home nation and to the entire world because these things go hand in hand. There is a famous quote from Benjamin Franklin, one of America’s founding fathers, that is very much worth reflecting upon, especially in a U.S. national context. At the time when the fledgling 13 states were debating whether they should form a United States or not, one of the United States’ founding fathers basically said “We have a simple choice: We must all hang together, or most assuredly we will all hang separately.” That’s why I believe that Franklin was the world’s first globalist. Put into today’s language, if nations don’t cooperate, we will all go down the drain by ourselves. Temperatures will continue rising if we put our head into the national sand. The three action levels – the local level, the national level and the global level – need to work together because only then can we have a force multiplier. What’s the alternative? Saying “Oh, the world is bad, we don’t want anything to do with it. We will have our nation shrink back into our borders and shut the world out” is no option. With Trump wanting to look inwardly, that means he is quite clearly wanting to give up the role the United States has taken in being the leader of the free world. Yes and no. He just looks at the world through the “my way or the highway” lens. He deals with trade issues not as a negotiation, but as laying down the law as a global sheriff. And that’s problematic. Trump also overlooks that global cooperation only makes sense if it is based on taking sensible national actions. It can’t be a substitute for them. Whether you look at the G7 or the G20, the premise of all these get-togethers is not to have some weird global body that comes up with some strange rules to do something. No, the endeavor only makes sense if the nation states participating do their own stuff and clean up in front of their own door. We need to clean up at the national level, because as nations we have the strongest interest to have a better country, better society each for ourselves. The G20, the G7 are there to make sure that whatever actions are taken is coordinated. It is a force multiplier, rather than everybody just stewing in their own juices and not looking over their shoulder to see how others are doing things. Also, if you are looking for a solution to a problem that your country has, the answer could well be found in what another nation does. That too is globalism. It is about reengineering your society in the experience that has been accumulated elsewhere. So these ideological battles over nationalism are no good. When Trump says “I don’t want any global regulation because any foreign nation, any foreign rules are going to be bad for America and are un-American,” that’s just a cop out. He foments a national spirit of irresponsibility. Trump really oversimplifies doesn’t he? 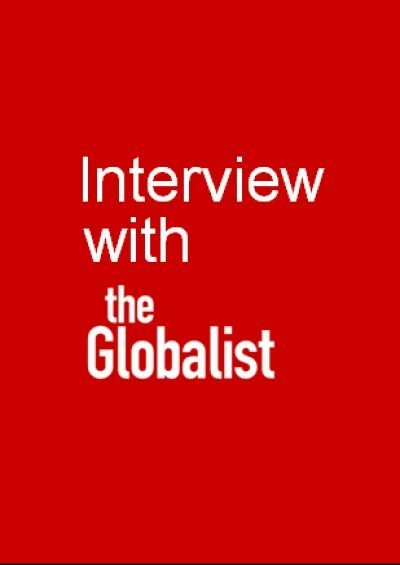 If I understand him correctly, what Trump is in effect saying is that if you are a globalist, if you believe that we all have to hang together, then you’re not a true American. Correct. And the interesting thing there is Trump should know better. If you look at the famous U.S. IT industry, many of the founders of successful start-ups came from India. The core strength of the United States of America to a large extent is due to the multinational composition of its population. Even Donald Trump must have seen that. When he was a real estate builder in New York, his construction workforce was probably composed of people from 20-25 different nations. So what Trump does is a remarkable form of denying the essence of the American experience. Yes. The United States is, along with us Australians and Canada, one of the three big immigration countries in the world where those countries can be, as you rightly say, defined by the mix of race and culture that they have brought together as one. And that’s a great strength. There are surveys that the Chinese may be very proud about China. But surveys also say that if the Chinese had a chance to live elsewhere, many would want to live in the United States. At a minimum, for the better air and more space than they find in China. What troubles me the most in the Trump shuffle toward nationalism and tribalism is something else. The United States has long served as a global model and a beacon of hope. Its example has generated a great deal of positive energies, including a can-do sense. Donald Trump nixes all that. While the world has looked up to the United States — and while quite a few countries, on many continents, have remade themselves internally in light of the American experience – becoming more entrepreneurial, a little more open, more multicultural, more accepting of other nationalities and so on (as the United States has traditionally been), Trump just says “screw you, we’re not interested.” And that way, he sets a terrible, dispiriting example. Trump’s extremely self-righteous stance is also not going to help successor governments in the United States. Trump not doing anything on climate change doesn’t solve the problem for the United States. At some point, the United States will have to do much more in terms of remedial action than would be necessary now. All that because Trump has called a “time out,” so that America won’t do anything anymore. Even in a truly national context, that’s terrible. Yes, it is. Can we finish on this point? In fact, you make this point: Perhaps the people who are globalists, who accept that we have to hang together, are double-patriots. They do care about their native country. They are patriotic. But they care about everyone else as well. For that insight, and this conversation, Stephan Richter, I say thanks for joining us.